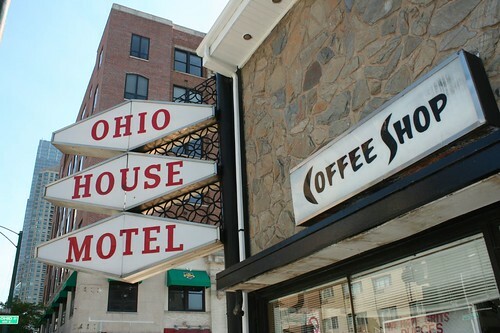 In December 1960, a tiny notice in the Chicago Tribune announced the opening of the Ohio House Motel in western downtown Chicago, at LaSalle and Ohio Street. Fifty years later, this tiny independent motel is still going strong. 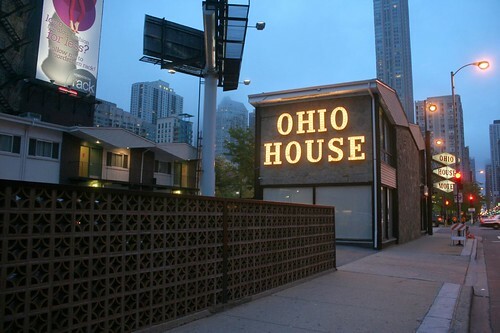 Distinguished by its funky diamond motif, the Ohio House is a vintage slice of roadside Americana plopped down right in the middle of downtown Chicago. 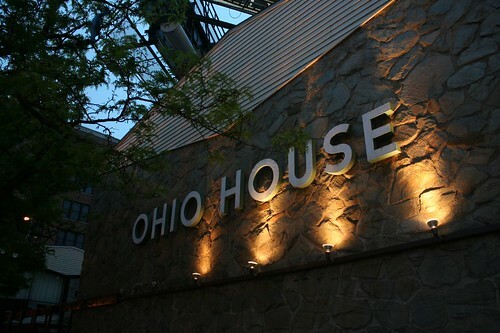 The Ohio House sits mostly at the back of its lot, with parking in front and a tiny but popular diner on the corner. A gigantic billboard is suspended from a huge metal column which plunges down right into the parking lot. 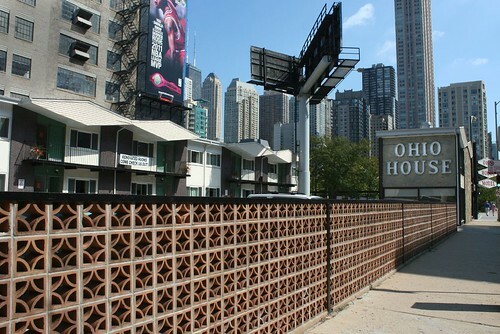 Apart from the diamond roofline, other points of interest include the matching suspended sign, held up by a geometric metal grid which is itself reflected in the pattern block fence that runs along Ohio Street. 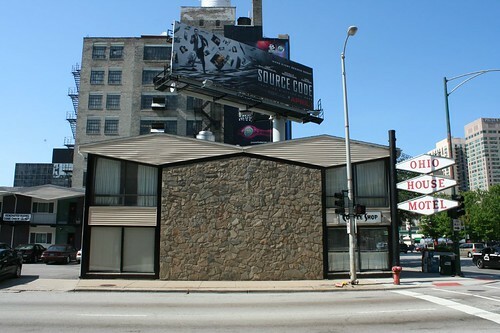 Rough-faced stone walls and a large stainless steel sign on the east facade add further 1960s ambiance. 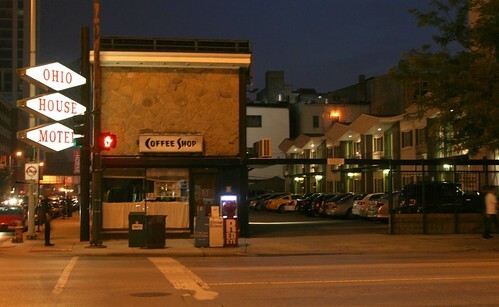 Though it’s distinctly a Chicago Mid-Century style design, the funky lettering on the coffee shop sign – especially the boomerang “C” – suggest a hint of Googie ambiance. 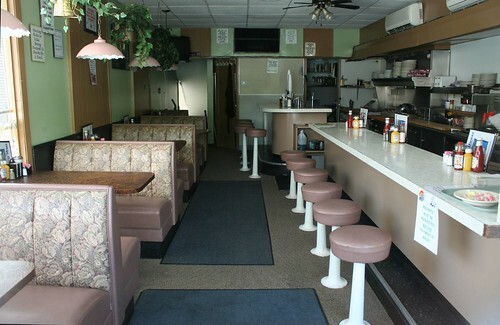 In the late 1990s, as the neighborhood transitioned from seedy to gentrified, the motel’s owner planned to demolish the motel and replace it with a far larger chain franchise. The building’s demolition was announced as imminent in 2001. 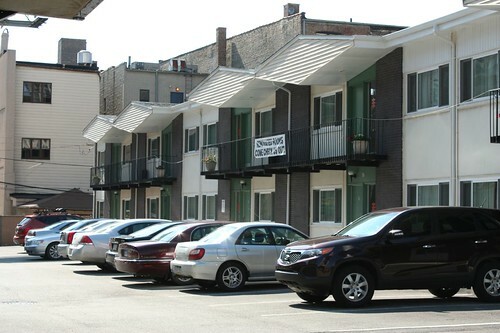 Yet the plans never went through, and the motel still offers clean and remarkably affordable rooms right in downtown. This entry was posted in Midcentury Modernism, Roadside architecture. Bookmark the permalink.